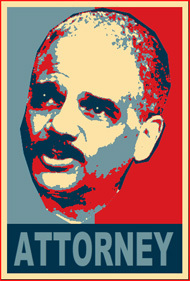 Eric Holder is the United States Attorney General chosen by Barak Abama to enforce the laws of the country. The Federal Trade Commision is responsible to regulate business conducted between states with differing laws such as collecting debts from one state to another. One such law is the Fair Debt Collection Practices Act. See also RICO. Click on the picture to learn more about our US Attorney General. In Idaho and many other states shoplifting is not a crime. It is not petty theft nor a misdemeanor but a civil action. The law has been so simplified to protect children that it leaves a vacuum where unintended consequences have allowed racketeers to enter the scene and extort minors and their parents hundreds of millions of dollars annually. 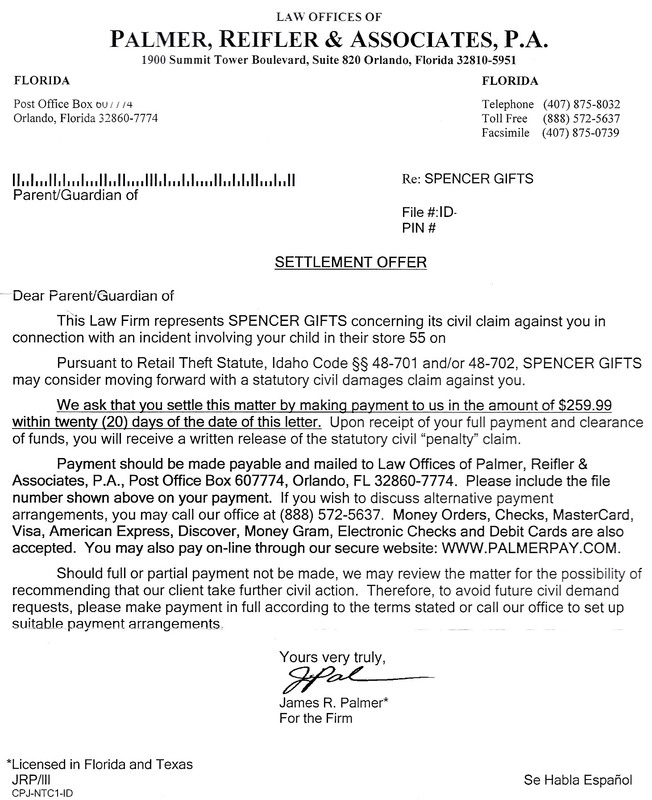 If you or your child has been charged, you may be at risk for interstate fraud. I speak only for Idaho and you should research your own state laws to see if there is a distinction between petty theft and shoplifting or retail theft. There was a distinction drawn over 5 years ago to separate childhood infractions from the jurisdiction system. Essentially the seller sets the price and if the buyer agrees and pays the price he leaves the location with the goods. No problem. If the buyer changes the price tag or hides the goods the seller may ask the thief (at this point) to show the goods. The seller may ask for assistance in documenting the theft by calling a security guard or official police officer. A police officer is normally used to notify the parents of a minor child and require a parent to sign for custody of the child. The police officer will likely read the child the standard Miranda which may not be apropriate because normal prosecution is not held in many jurisdictions. If the parent asks, he will learn the value of the goods but this information is not noted by the officer since it is the seller's duty to prove this in a civil claim. The person making the arrest will not give any legal advice but may give the buyer the name of an attorney acting for the seller. Idaho law is benevolent and trusts the relationship between the buyer and seller will not end in a bribe or extortion. A civil action assumes the buyer and seller reach an agreement and that a suit may not be necessary. Your identity might be used to extort you. The officer on the scene may not give you any information at all and the next thing you will discover is that a week later you will recieive a letter from someone who represents himself as an attorney. He may or may not be an actual attorney with standing in your state. One of the largest debt collection rings works out of Orlando, Florida convenient to the many retail shops of Disney World. 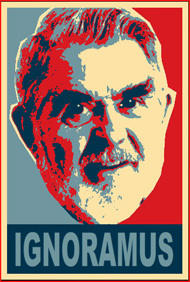 You may even be invited to pay the demand online. There is no penalty to the merchant for not posting this large ugly sign but by not doing so he forfeits his immunity under Idaho law to prevent litagation. This exposure is not limited by this law. In actual practice this notice is not posted anywhere in the largest mall in Boise. A great majority of vendors are not immune to counter suit. I am Leon Goodman, a resident of Boise, Idaho USA for the last 10 years. Since my retirement from Bank of America I have been active in Internet blogging and photography. I have photographed such eclectic locations as Guatemala, Belize, Mexico, Washington DC, San Francisco, and Tea Party events on the steps of the Idaho State Capitol. I am the owner and principal operator of the web site ignoramus.us, specializing on political content and things we don’t know anything about. I also blog about myself, family history, bookbinding, and interesting people I have met including a number of con artists, one of whom was a bank vice president and imposter. My challenge when I was first employed by Bank of America thirty years ago was to save $4 million in paper printing costs. At review time I saved over $18 million. My bonus allowed me to move from my rented apartment to my own home near Twin Peaks in San Francisco. My happy years with BoA allowed me to make many more million dollar savings supporting computer based systems for mortgage loan preparation, fraud prevention and ATM cash vault support. My connections to Hewlett Packard in Boise directed $20 million in printer sales benefiting many families working in the Boise facilities. I also worked hand in hand to create printer connectivity on local and network printers. I was very privileged to learn more about bank fraud from Catch Me If You Can character and FBI consultant, Frank Abagnale . My previous addresses include New York, New Jersey, Texas, Arizona and six cities in California. In LA I was a performing member of the Hollywood Magic Castle.